Now open, Loews Sapphire Falls Resort at Universal Orlando, our newest on-site hotel, transports guests to a paradise in the heart of the tropics. Blue waterfalls cascade over lush grounds, and in the distance, the calming sounds of steel drums call guests to take in the scenic water views, ease into island time and let go. Imagine a picturesque hotel built in the heart of the tropics, where every comfort is included. Loews Sapphire Falls Resort features a beautifully landscaped, resort-style pool with a water slide surrounded by cascading waterfalls, this hotel truly captivates at every turn. From the ruins of the stone turret in the lobby to the inviting island charm of the 1,000 guest rooms and suites, guests will be surrounded by a vivid, textured haven that is inspired by landmarks of the islands. Guests staying at this on-site hotel enjoy exclusive benefits at Universal Orlando Resort including Early Park Admission to The Wizarding World of Harry Potter one hour before the theme park opens; complimentary water taxi and shuttle service to and from the Universal Orlando theme parks and Universal CityWalk, and much more. Loews Sapphire Falls Resort offers an island escape in the heart of an unforgettable adventure. Please cancel at least five days prior to arrival. Failure to cancel by this time will result in a penalty of one night s room rate plus tax. Refunds are issued back to clients credit cards within 5 business days from day of cancellation. New Dutch Trading Co. is the grab-and-go option for families who want to stock up before heading off on adventures. With ready to go meals, beverages, fresh-baked breads and homemade jams, this is the stop for provisions and supplies. Caribbean cuisine prepared in an open exhibition kitchen makes Amatista Cookhouse an instantly inviting option for breakfast, lunch or dinner. Whether dining indoors, out or in one of the private dining areas guests of Amatista Cookhouse will feel welcomed and relaxed in this vibrant and inspiring restaurant. 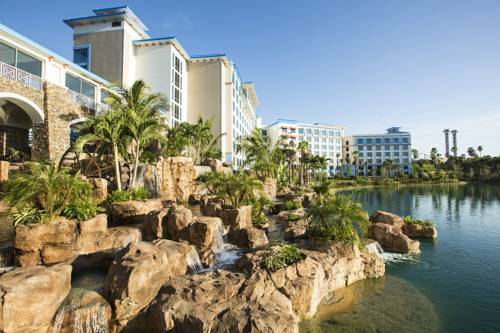 Take your vacation to the next level at Universal Orlando Resort. With three amazing theme parks Universal Studios Florida, Universal s Islands of Adventure, and Universal s Volcano Bay water theme park, opening 2017 spectacular on-site hotels and more, it s days and nights of endless fun for everyone. Immerse yourself in the next generation of blockbuster entertainment at Universal Studios Florida. You ll script an incredible day of fun at this real, working film and TV studio that features rides, shows and attractions that put you right in the middle of the action. Journey through the legendary worlds of incredible heroes at Islands of Adventure. Here you ll step right into powerful stories, myths and legends on rides and attractions that will excite all your senses. Enjoy the thrills and relaxation of a tropical paradise like no other. At the all-new Universal s Volcano Bay water theme park, opening in 2017, you ll find an oasis of excitement along with laid back luxuries creating an entirely new vacation experience.